hk_technicals has no other items for sale. 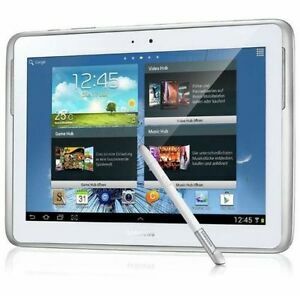 Lightweight and compact, the 3G Samsung Galaxy tablet comes in a portable design that you can take with you anywhere. Its impressive 10.1'' touchscreen LCD display allows you to enjoy HD quality videos from the comfort of your own palm. Wi-Fi enabled, the Galaxy tablet uses the Android 4.0 operating system, which offers an intuitive interface and improved connectivity.Keep in touch with distant family and friends with the built-in camera featured within the tablet. This tablet also has a 16GB hard drive and a long-lasting battery life so you won't have to worry about recharging often. EX-DISPLAY GRADE A TABLET MAY SHOW SLIGHT MARKS FRONT AND BACK. TABLET COMES IN ORIGINAL BOX WITH CHARGING CABLE(NO ADAPTER). Technical Details Colour: White OS: Android Jelly Bean Processor: 1.4GHz Quad Core CPU Clock Rate Display: 10.1" WXGA TFT Technology Resolution: 1280 x 800 Display Resolution SDRAM Memory: 2GB SDRAM Memory Memory: 16GB WiFi: 802.11a/b/g/n Channel Bonding 4G LTE Bluetooth: BT 4.0 LE USB: 2.0 High Speed Camera Resolution: CMOS, 5.0 MP, 1.9MP Battery Capacity: 7000mAh Features: S Pen Dimension (HxWxD): 180 x 262 x 8.9mm Weight: 597g Box includes Samsung GALAXY Note GT-N8020 16GB - White USB Cable. Payment to be made within 24 Hours of the end of the auction unless otherwise agreed. Any payments not received within this timeline will have an unpaid reminder sent. Please note we pride ourselves on honest trading and excellent after sales service. If you do intend to leave anything other than positive feedback please contact us first so we may resolve this. We now take legal action against any negative feedback comments which are unfair, libellous or defamatory. This is to protect our good name which we have strived hard for to achieve. Any legal costs are passed on. Customs Information: Please note the buyer is liable for any customs charges in the event that your country of residence imposes import duties, tariffs or charges on your order. Rarewaves has no control over these charges and they vary from country to country. As the purchaser of the goods, you will be considered the importer by your country's customs authority. There is no duty for the EU and the UK. 1- All dispatch will take place after Paypal Payment clearance and some time it will take 24 hours to get Payment cleared by Paypal. 2- The purchase item will be sent to Paypal confirm address only. 3- All purchases will be posted on same day if purchase before 11:00am (Mon-Fri) 4- If purchases made on Friday after 11am then dispatch will be on Monday with next Day Delivery. If you want a tablet that takes super sharp photos, this isn't for you. No camera flash and only 3 megapixel front camera. But as a work tool and a tablet to relax with, it's great. Well fast enough, well built and good value for money. The screen is perfecet and the body overall is in good shape with few marks of any description and nothing at all serious to worry about. Overall a good buy and it came with a good quality case as well! Lovely product but has issues with accepting all sim cards even though it is unlocked to all. Will still recommend it as its very handy and useful with great features to explore.